All About the ALSOPS: It rarely snows in Charlottesville! It rarely snows in Charlottesville! So after 24hrs. of non-stop snow we ended up with about 27in. Kinda crazy that during our 1 year in Charlottesville we were here to witness their 4th largest storm in history. We tried our hardest to enjoy it but struggled knowing it was definitely going to mess up our travel plans to UT. Here, I was nervous that we may struggle with weather problems in Salt Lake traveling this time of year. Never in my wildest dreams did I think all the trouble would come from our end. Our great neighbors helped ease our minds as we all headed out to play in this winter wonderland. We couldn't b believe what we were looking at! 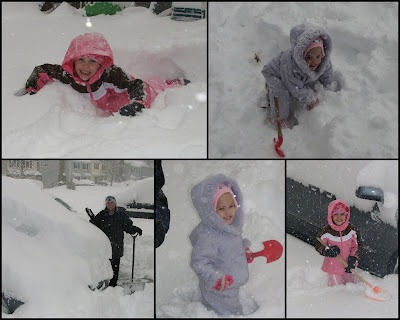 Sky tried his hardest to kee p up with cleaning off and digging out the car and the girls were up to their waists in snow. They lasted for awhile and we had a good time attempting at some sledding despite Lexi's face plant on her trip down with Ky scaring her sledding experience for a little while. Sky of course attempted the Unthinkable! After a fun day of snow we faced the unknown future of our travel plans and countless phone calls to the airlines. Our flight was finally officially canceled out of DC and at this point they said they couldn't get us out until x-mas Eve. This just wasn't gonna cut it! After working with several supervisors we got rebooked out of GREENSBORO,NC. We did head out Sunday morning in the JEEP to see if we could make it. After about 20miles of passing countless stuck cars and swerving around numerous fallen tree branches we hit the police barricade and knew we had to turn around. Explaining all this to a devastated 5yr. old who now hates snow and desperately just wanted to be in Utah was so hard. Our good neighbors greeted our arrival back home and let us crash at their place. It was so nice for the girls to have friends to play with keeping their minds off of the situation and keeping me from overly stressing which is something we all know I am great at. We had a great warm lunch, let the sun beam for a few hours and then headed back out on an alternate route finally making it to Greensboro after 5 hrs. (a drive that normally takes 3) swam in the hotel pool, unwound, caught a flight Monday morning, arrived in SLC that afternoon..............and when all was said and done only missed about a day of the trip! that a lot of snow :) my brother is on his mission in richmond, but they only got about 15 inches or so he said...lucky you guys :) glad everything worked out though! how crazy! you'll never forget that experience. and i am glad everything worked out in the end. have fun planning your trip to disney!! i love the pix of your girls with their umbrellas. very cute! forgot to mention that i love your new family picture for your header!!! Man! That totally stinks! I can't believe the odds of snow in your town. I'm glad you finally made it out to Utah. We keep trying to make your year here memorable and the snow storm did the trick I think! I'm so glad you guys persevered and made it all happen to get out with family.